...they are sad, indeed. But new beginning are right around the corner, eh? I enjoyed the LOST ending and I think I finally got it all figured out. Yeah, right. This link, really says it all for me. But I despised the 24 ending. I think they chumped out. It was the same old, same old. Sigh. 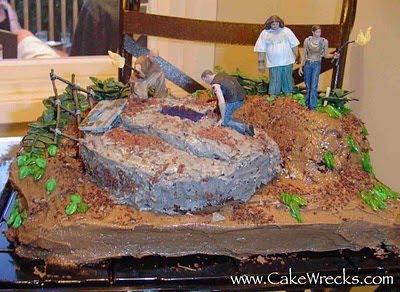 OMG, I just found cakewrecks the other day and thought it was the best thing ever!!!! I don't watch either show, but those cakes sure look fun! Awesome cakes! I LOVED the ending to LOST. It fit beautifully with my view of life and our reasons for being here. I can't wait to read the link you provided. 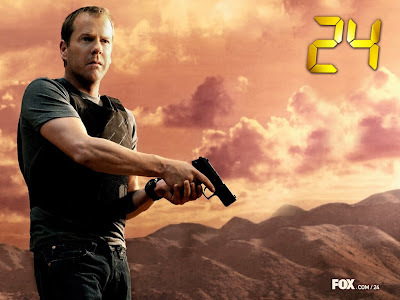 I never watched 24, but it's a bummer when a series finale doesn't live up to expectations. I was so very satisfied with the conclusion of Lost. I can't imagine any other way for it to conclude, and I was a weepy mess by the end. Some of those tears could have also been the result of some of my confusion FINALLY being abated! I haven't watched the finale of 24 yet, though, and I'm sure it's for the very reason you stated. Every year it just kind of ends and you think "Why did I spend 24 weeks watching this show?! I'm not watching this show next season." I guess I'm grateful the finale takes care of that last query for me, and to be honest, I'm relieved, because that show has been the same thing for several years now...but I'll still watch the last three hours on my DVR! Hilarious cakes! I just saw a book about horrible cakes in Borders and I was seriously in tears and making a scene bc I couldn't stop laughing. Those cakes are awesome! But I hav to disagree on the Lost finale...i thought it was disappointing to say the least :( Now the Grey's Anatomy season finale, that had me on edge the entire time! I don't watch 24 but was devoted loyal fan of Lost. I liked the ending, I wasn't sure they could tie it up in the last two hours but they did. And why did I cry at every Sun and Jin scene for the last 4 seasons! I will miss it, so intricate. And yeah those cakes are amazing, have you seen the show Cake Boss. He has some crazy wild cakes and other baked goodies. haha those cakes are awesome!! also, i feel so bad because i don't watch Lost, or 24, or Law and Order, or any of those shows that are ending/have ended. everyone else seems a little sad around the blogosphere! I tried so hard to watch 24, but I just couldn't get into it. It was so same thing over and over to me. I hate that in shows. I also didn't get into Lost. I think that it was on at the same time something else we watched was. I do have to say that I am sad that so many shows have been cancelled. Some of them were really good ones too. Hopefully they will be replaced with something better! That list of questions was AWESOME! I thought *I* came up with a lot, but I missed so many more. I'm SO angry with the writers from that show. Grrrr. Anyway ... thanks for stopping by my blog yesterday! I liked the lost ending but you are so right about the link, it asks all the things I wanted to ask too! Loved it! That link is classic! Loved it. And I loved the ending too. I think it was perfect. I didn't watch Lost, but I might get DVD. Is it my imagination or are those cakes really wrecked? I love the cake boss. 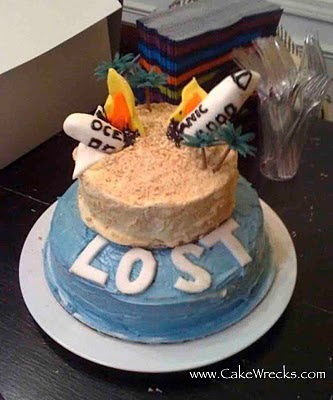 OMG I want the first LOST cake! That is too cool. Can I have a life size replica of Sawyer? :P *ahem* I was real worried that they were going to kill Jack. I didn't want that. He really went off the deep end. And yeah... it was the same, but it left the door open for movies. Where as LOST well...not so much. LOL. I saw that link too and so I would say I am still LOST! I'm a big fan and have been watching since day 1. I liked the finale but still so many things unanswered. Hope the Lost Movie rumors are true! The cakes are awesome. The link was fun! I don't watch 24 so I will have to see what my husband thought about that ending. I watched the last 20 minutes of Lost about 5 times. they were all dead after all? I dont thnk so, I mean, nothing is ever sure about Lost right? LOST cakes! Those are deffo awesome. Hey! Came on over from Elana's blog. I'm also a LOSTie!! STILL get sad when I hear the LOST music :( And I dug the ending too. I think they paid respect to the show, the characters and the mystery of it all. Great post - and great blog! New follower!! I didn't watch 24 :( It may be time to start up the Netflix subscription again and watch 'em all. LOST I liked but I didn't love. My husband watched the finale twice, I was just, EH!